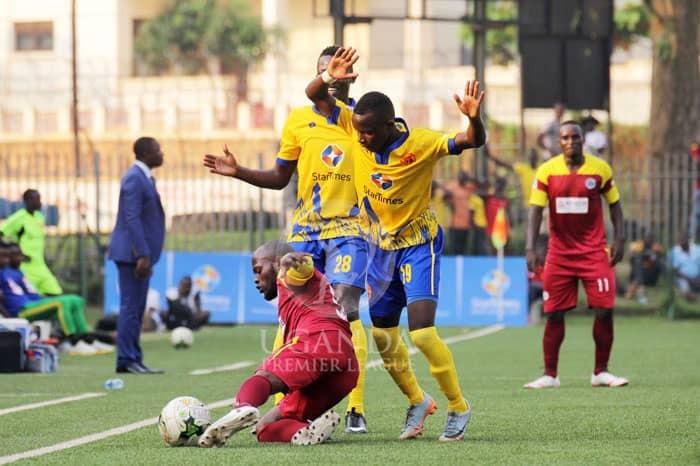 KCCA FC now hold a four point caution atop the StarTimes Uganda Premier League following a 3-1 hard fought victory over Ndejje University at Lugogo on Saturday. The game was delayed before Kick-off after the visitors-Ndejje arrived late but despite threats for the fixture being postponed, it kicked off any way. Despite the home side enjoying the Lion’s share of possession, they could not bleach Ndejje’s resistance in the first 45 minutes and referee of the year, Brian Nsubuga sent both sides into the break dead-locked at 0-0. Nine minutes into the second half, Muzamir Mutyaba who was returning from injury gave Mike Mutebi’s side the lead and you could feel the relief around Lugogo. However, their lead lasted only 10 minutes before Ndejje equalized through Anwar Ntege. The goal only ignited KCCA to go forward and scored two quick goals in a space of four minutes to seal the game. First it was Muwadda Mawejje who struck on 73 minutes to restore the Kasasiros’ lead and then young-star Steven Sserwadda made the points safe with his first of the season on 77 minutes. The victory took KCCA onto 24 points, four ahead of Onduparaka FC in second. For Ndejje, the remained in 14th having accumulated only 7 points from their first 10 games. In the Arua Derby, Onduparaka required two second half goals to come from a one down and defeat sworn enemies Paidah Black Angels 2-1 at the Green Light Stadium. Andrew Kidega put the visitors in front on 9 minutes with a well taken strike and despite efforts by Onduparaka to restore purity before the break, Muhammad Kiseka’s side held on to go into the break with a slim one goal advantage. 11 minutes after the break, Gadafi Gadinho equalized for the home side to send the Green Light Stadium into a frenzy. With 7 minutes on the clock, Ceaser Ochuti scored the winner for Onduparaka and in the process, broke Paidah’s hearts. Victory for Onduparaka elevated them into second on the log with 20 points after 10 games while Paidah remain bottom on four points. At Mwerere, Bright Stars were held to a second consecutive home draw by Jinja based, Bul FC. Going into the game on the back of a 1-1 draw at home to Express FC, Fred Kajoba’s side took the lead on 48 minutes through talismanic Captain-Nelson Ssenkatuka who took his season’s tally to six. However, the three points would not come for the Stars as Deogratious Ojok equalized for the visitors on the hour mark. The relentless pressure on Bul’s goal late on in the game would not tell for the home side as both teams settled for a point in the end. Bright Stars slip into 3rd on the table with 19 points while Bul remain 6th on 15. In the game played at the Mighty Arena in Jinja, Express FC were subjected to a third loss of the season, a second in a row. After losing to Onduparaka in their last game, the Red Eagles were optimistic of a result but in a game in which they barely created clear-cut chances, Kefa Kisala’s side were undone by a Joel Madondo goal with only 9 minutes of the 90 to play. This was Madondo’s 7th strike of the season and it came after a four game drought for October’s player of the month. The loss for Express sees them drop into 10th on the table with 13 points from 10 games. For Kirinya, they climb into 9th having accumulated 14 points so far in the season. At Kakyeka, Mbarara City and ten-man URA FC played out a 1-1 draw in front of a mammoth crowed. URA who have now drawn all their last six games, took the lead through a Tayo Odongo’s 42nd goal and thought they were headed for a third victory of the season. However, all their hard work was undone in four crazy second half minutes. First, Sirage Ssentamu was shown a second yellow and given his marching orders with 10 minutes to play. Then Rashid Mohammed happened on 84 minutes as the forward struck to level matters for the Ankole Lions. The draw is the 8th for Sam Simbwa’s side and despite still enjoying a unbeaten start to the league, the Tax Collectors sit a disappointing 7th on the table. For Mbarara, they slip into 5th on the table with 17 points, their best tally at this stage since returning to the top flight three seasons ago. In the last game of the day played in Buhinga, Tooro United defeated Nyamityobora 2-1. With all the three goals coming in the first half, Steven Omuria put the hosts-Tooro United in the lead inside the first 8 minutes. Charles Musige equalized for Asaph Mwebaze’s side on 20 minutes but Mike Kawooya struck with 13 of the first half to play, to restore Tooro’s one goal caution going into the break. Neither side could strike in the last 45 minutes as Tooro United registered their second victory of the season while Nyamityobora were subjected to a eighth loss this campaign. Tooro now sit 12 on the log with 10 points while Nyamityobora who have gathered only four points this campaign, are still second from bottom. The StarTimes Uganda Premier League resumes on Sunday witb Vipers SC at home to Police FC in Kitende.